Skills and abilities: Skilled hand to hand combatant and keen scientific intellect. Powers: Maxam has a mind highly resistant to telepathic probes and psionic Attacks. He also has the power to alter his size and mass to increase his strength to almost limitless proportions. While in the past his strength as tested by Adam Warlock was seen as comparable to Hulk. Born in a word where humans are nearly extinct thanks to Magus a megalomaniac who ran “the Universal Church of Truth”. Along with one other earth based survivor he was trained with a singular purpose to destroy Magus. They were trained by a Badoon named Master Ecclaw. It was Ecclaw who fortified his mind so that none would learn his true mission once he traveled back in time. Unfortunately when he traveled back he was rendered Amnesiac. 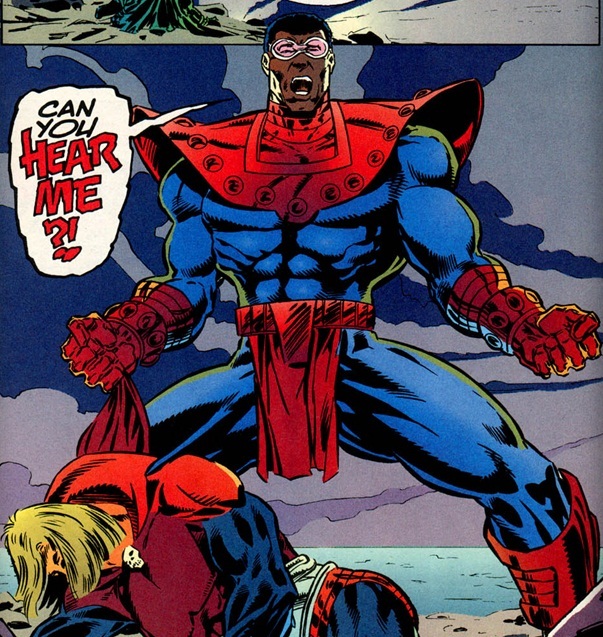 As a result he was unable to complete his mission to kill Adam Warlock before he became Magus. He battled the Fantastic four and even broke through the Invisible Woman’s force field. Maxam ended up joining Warlock’s Infinity guard. While with the team he had contention with teammates Gamora and Drax the destroyer. When Gamora left his was given the Infinity gem of time which caused him to remember everything eh had forgotten. He battled Warlock and seemingly killed him though with a heavy heart. With his mission complete he returned to his own time. Unknown to him Warlock’s death was an elaborate illusion created by Warlock to end the conflict.